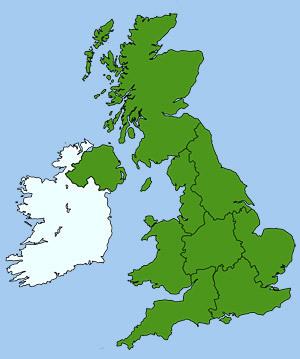 Tea is a staple hot drink served in Britain. It has become such an integral part of our culture that the traditional afternoon 'cuppa' is now a British institution, in fact it is difficult to imagine life without it! When it was first introduced in the 17th-century it was a luxury product that only the rich could afford but today, due to its popularity, it is widely available and affordable to all. Medical science has also recently discovered that tea has many health-giving properties. There are many varieties of tea available but black teas are mainly drank in Britain such as Assam, Darjeeling and Ceylon or a blend of these. 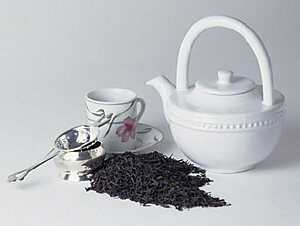 Most English tea is served with milk but some can be taken without, such as Earl Grey and green teas. Boil the water and pour a little into the tea pot, swirl it around to warm it, then pour it out. Add the tea leaves or tea bags to the tea pot (one heaped tea spoon or bag per cup). Add boiling hot water to the tea pot and leave to stew for at least one minute (the longer you leave it the stronger the tea) and put a tea cosy on the pot to keep it warm. You can either add the milk to the cup first or add the milk after the tea has been poured. This is a matter of taste and you can experiment to see which you like best. However, if you are using best china cups, add milk first or a little cold water to prevent the cup cracking. If using tea leaves, pour the tea into the cup through a tea strainer. If using tea bags, simply pour. Add milk to taste (if not added before). Take care as hot tea can scold! so leave it to cool a while before drinking. Either drink it on its own or serve with cake or biscuits. Never put cream in tea, either use milk or lemon, depending on the type of tea used.